Background Phrenic nerve reconstruction has been evaluated as a method of restoring functional activity and may be an effective alternative to diaphragm plication. 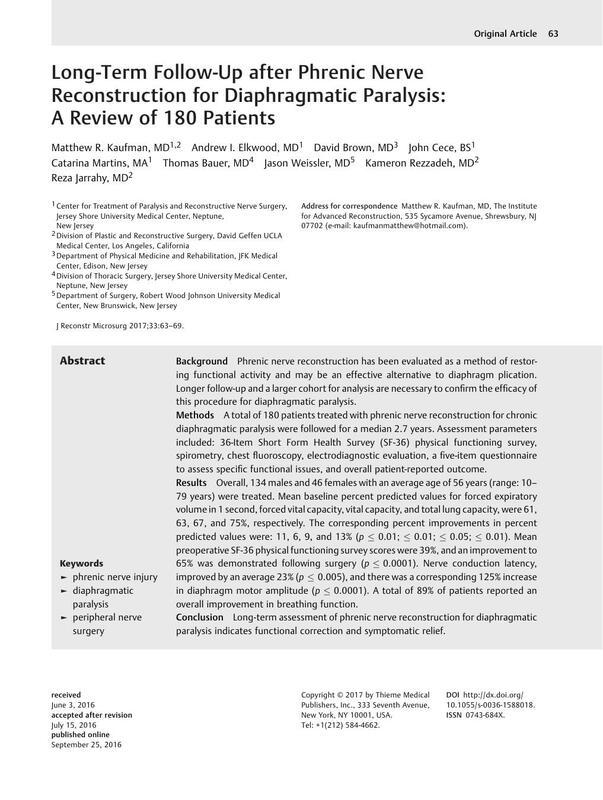 Longer follow-up and a larger cohort for analysis are necessary to confirm the efficacy of this procedure for diaphragmatic paralysis. Methods A total of 180 patients treated with phrenic nerve reconstruction for chronic diaphragmatic paralysis were followed for a median 2.7 years. Assessment parameters included: 36-Item Short Form Health Survey (SF-36) physical functioning survey, spirometry, chest fluoroscopy, electrodiagnostic evaluation, a five-item questionnaire to assess specific functional issues, and overall patient-reported outcome. Results Overall, 134 males and 46 females with an average age of 56 years (range: 10–79 years) were treated. Mean baseline percent predicted values for forced expiratory volume in 1 second, forced vital capacity, vital capacity, and total lung capacity, were 61, 63, 67, and 75%, respectively. The corresponding percent improvements in percent predicted values were: 11, 6, 9, and 13% (p ≤ 0.01; ≤ 0.01; ≤ 0.05; ≤ 0.01). Mean preoperative SF-36 physical functioning survey scores were 39%, and an improvement to 65% was demonstrated following surgery (p ≤ 0.0001). Nerve conduction latency, improved by an average 23% (p ≤ 0.005), and there was a corresponding 125% increase in diaphragm motor amplitude (p ≤ 0.0001). A total of 89% of patients reported an overall improvement in breathing function. Conclusion Long-term assessment of phrenic nerve reconstruction for diaphragmatic paralysis indicates functional correction and symptomatic relief.